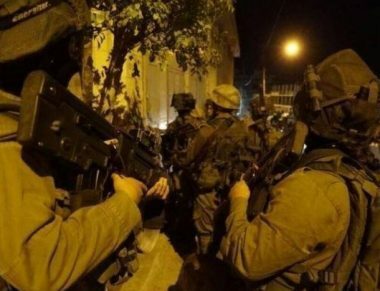 The Palestinian Prisoners’ Society (PPS) has reported that Israeli soldiers abducted, on Wednesday, at last twenty-seven Palestinians, in several parts of the occupied West Bank. The soldiers violently invaded and searched dozens of homes, and interrogated many Palestinians while inspecting their ID cards, before abducting twenty-eight, including a female photojournalist, identified as Ra’eda Sa’id, who was taken prisoner from the courtyards of Al-Aqsa Mosque, in occupied Jerusalem. 1. Saed Abi al-Baja, Betunia – Ramallah. 2. Sami Abu Hussein (former political prisoner), Betunia – Ramallah. 3. Ibrahim Ahmad Tamimi, Dier Nitham – Ramallah. 5. Odai al-Amour, Yatta – Hebron. 6. Mohammad al-Amour, Yatta – Hebron. 7. Rami Najjar, Yatta – Hebron. 8. Mohammad Jibrin, Yatta – Hebron. 9. Ahmad Jibrin, Yatta – Hebron. 10. Omar Mohammad Barghouthi, Ramallah. 11. Nassim Hosni Barghouthi, Ramallah. 12. Ayyoub Rasmi Abu Alia, al-Mghayir – Ramallah. 13. Montasser Misbah Abu Alia, al-Mghayir – Ramallah. 14. Ahmad Tayyeb, Jenin refugee camp. 15. Tamer Ahmad Tayyeb, Jenin refuge camp. 16. Saber Ahmad Tayyeb, Jenin refugee camp. 17. Rauf Ahmad Tayyeb, Jenin refuge camp. 18. Wisam Abu Zeid, Jenin refugee camp. 19. Awni Kamil, Qabatia – Jenin. 20. Issam Saba’na, Qabatia – Jenin. 21. Abdul-Hakim Mousa, Marka – Jenin. 22. Moath Mousa, Marka – Jenin. 23. Fadi Hussein al-Atrash, Kafr Ra’ey – Jenin. 24. Borhan Mustafa al-Atrash, Kafr Ra’ey – Jenin. 25. Omar Mheisin, Shu’fat refugee camp – Jerusalem. 26. Mahmoud Sa’adi al-Adawein, Shu’fat refuge camp – Jerusalem.